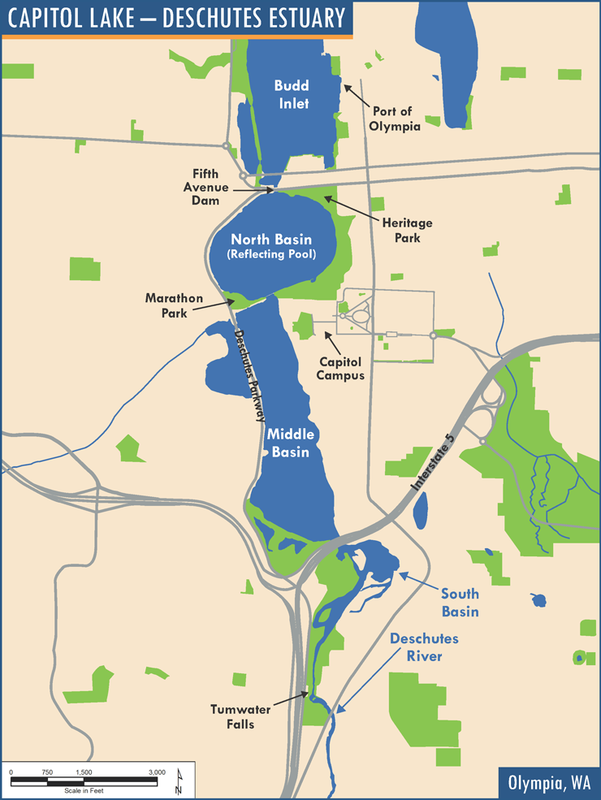 The Capitol Lake – Deschutes Estuary includes the 260-acre Capitol Lake Basin, located on the Washington State Capitol Campus, in Olympia, Washington. This waterbody is an important recreational resource and valued amenity; however, it suffers from numerous environmental issues. Every year more than 35,000 cubic yards of sediment from the Deschutes River is deposited within the lake basins, resulting in increasingly shallow conditions. Today, the lake is about 21 percent smaller and it holds roughly 60 percent less water than it did in 1951. Over the years, high bacterial levels and the presence of invasive species have resulted in impacts to the recreational use of Capitol Lake. The presence of New Zealand mudsnails resulted in official closure to all active uses in 2009 and active use of the waterbody continues to be restricted today. In 2016, stakeholders, in collaboration with Washington State Department of Enterprise Services (Enterprise Services), identified common goals that should be satisfied by any long-term management alternative. In 2018, Enterprise Services was directed by the State Legislature to develop an Environmental Impact Statement (EIS) that evaluates alternatives for long-term management. Enterprise Services is now preparing an EIS to document the potential environmental impacts of various alternatives and determine how these alternatives meet the long-term management objectives. 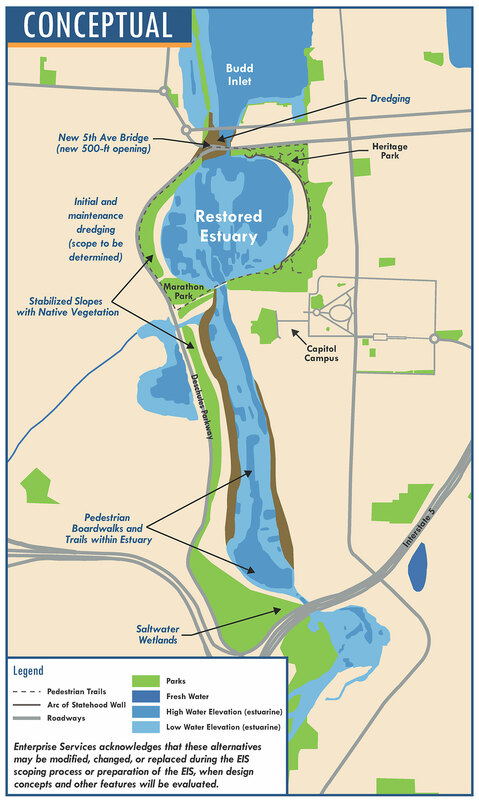 The EIS will evaluate and identify a preferred environmentally and economically sustainable long-term management alternative for the Capitol Lake – Deschutes Estuary Project. Capitol Lake – Deschutes Estuary includes the 260-acre Capitol Lake Basin, located on the Washington State Capitol Campus. The Capitol Lake Basin is located within the area extending from the south end at Tumwater Falls in the City of Tumwater to the north end at the Fifth Avenue Dam in the City of Olympia. While the limits of the Capitol Lake – Deschutes Estuary Long-Term Management Project are focused on the area that Enterprise Services manages (the Capitol Lake Basin), it is recognized that the interconnectedness of the system requires coordinated agency efforts. What alternatives are being evaluated? Enterprise Services has identified a minimum of four primary alternatives to be evaluated in the EIS. The fundamental concepts for these four primary alternatives are summarized below. Several options and concepts, or variations of the primary alternatives have also been proposed. The Managed Lake Alternative is similar to existing conditions, with additional strategies to manage sediment accumulation and future deposition, including maintenance dredging within the North and Middle basins and selective dredging within the South Basin. 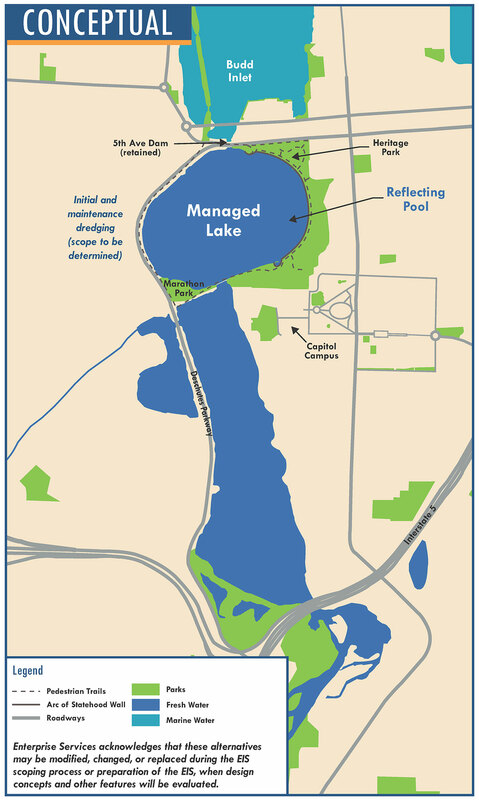 The Managed Lake Alternative would retain the Fifth Avenue Dam and tide gate in its current configuration to maintain the historic reflecting pool and the Capitol Lake Basin. Under the Estuary Alternative, full tidal hydrology would be restored throughout the entire basin. An opening in the current Fifth Avenue Dam would be constructed sufficient in size to allow tidal exchange within newly formed mudflats. This opening would allow tidal flow (saltwater) within the North basin during approximately 75 percent of tidal elevations. Sediment would be managed through initial dredging in Capitol Lake Basin and recurring maintenance dredging in Budd Inlet. Sediment would be managed through initial dredging in Capitol Lake Basin and recurring maintenance dredging in Budd Inlet. The Hybrid Alternative allows management of the basin by establishing a tidal estuary in the western portion of the North Basin, and throughout the Middle and South Basins. An opening at the Fifth Avenue Dam would be constructed to allow for tidal flow. A retaining wall also would be constructed, at approximately the centerline of the North Basin, which would result in a 39‐acre saltwater reflecting pool adjacent to Heritage Park in the North Basin. Construction and maintenance of the smaller reflecting pool, in addition to restored estuarine conditions in part of the basin, gives this option its classification as a hybrid. 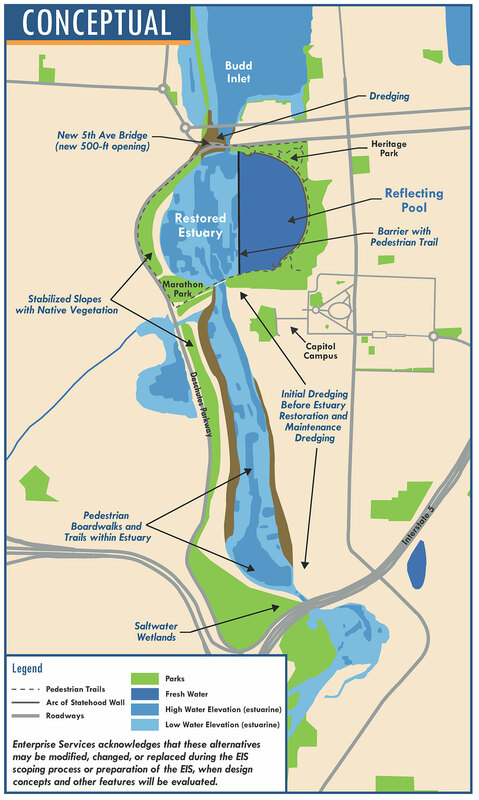 Sediment would be managed through initial dredging in Capitol Lake Basin, and recurring maintenance dredging in Budd Inlet. In an EIS, an analysis of the “No Action Alternative” is required, against which the effects of the action alternatives can be evaluated and compared. The No Action Alternative is intended to represent the most likely future for the project area if the project is not implemented. Operations and maintenance activities to retain the existing Fifth Avenue Dam and tide gate in its current configuration would continue. Enterprise Services would continue to implement invasive species management strategies. Sediment management strategies, like maintenance dredging would not occur. The No-Action Alternative would also include planned and funded actions that have been identified by the Washington State Department of Ecology and approved by the U.S. Environmental Protection Agency as part of a water-quality improvement strategy. A screening process will be used to identify the range of alternatives that move forward for detailed technical review in the EIS. Options and concepts will be screened for their ability to meet project objectives and their feasibility. Enterprise Services acknowledges that these alternatives may be modified, changed, or replaced during the EIS scoping process or preparation of the EIS.